Amazing location and breathtaking views! Nestled in the coastal foothills just off California Scenic Hwy 46 West - exactly halfway between the quaint artist village of Cambria (10 min.) and gateway to the spectacular Paso Robles/Templeton wine region (just outside your door). Newly remodeled cottage from the ground up. Enjoy top of the line furnishings, amenities and touches that one would expect from a nationally renowned artist. The large master bedroom is a Southeast Asian retreat with unique pieces from Nepal and Thailand. The queen bedroom takes you back to early California. The kitchen is fully stocked and has granite counter tops and stainless steel appliances. Relax with a cool beverage on the patio overlooking the vast farming valley below or tuck yourselves back in the shade of the oaks and bay trees off the rear patio. 100% privacy enables you to enjoy the additional outdoor shower, use the massage table, read or watch the red tail hawks soar peacefully above. Nearby Activities: Hearst Castle, Wine tasting, Farmer's Markets, Morro Bay Estuary and Bird Preserve, Cayucos Beach Town, Summer Music Festivals, Paso Robles/Templeton Wineries. BBQ in your own 'park' complete with picnic table and shade trees. Beach towels, beach chairs, picnic supplies, maps to neighborhood wineries, massage table, yoga mats, binoculars/bird watching charts, high end beds and furnishings, Internet, Satellite TV, DVD library, BOSE docking station for your iPod, iron/board, blow dryer, local artwork, local product honor bar i.e. local wine selection, olive oil, lavender, postcards. Smoking Not Allowed: strictly enforced, for the benefit of the majority of our guests. Hi you’re looking to relax in one of the most beautiful spots on the Central Coast, this is the place! 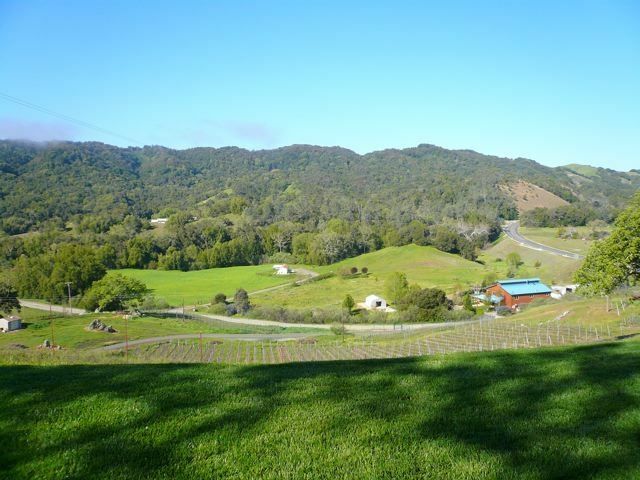 Sit on your porch and take in the rolling hills and vineyards while you sip a local wine. The attention to detail makes this cottage a very special place. It’s called the Artist Cottage for a good reason! This place will not disappoint! It’s the perfect place to escape the city. We loved it for the gorgeous views. The bed is very comfortable. It’s great to see all the green as soon as you wake up. We've been coming to Paso Robles for more than a decade, a couple times a year. We always stay somewhere different to get to know the many parts of this complex agricultural community. But we loved this place so much (scroll scroll scroll to our "So quiet, so peaceful, so perfect" review in Feb 2014) that when we had a week over Christmas to recharge our batteries, we said, "You know what, let's see if Lisa and Randy's place is available." The return visit was just as great. No rose-colored memories here. Still so quiet. Spectacular views. Amazing sunsets. A fully-functional kitchen for when we wanted to doctor up Pier 46's stellar cioppino or even make our own lasagna. Amazingly comfortable beds (including a Cal King for those who love to sprawl). Efficient pellet stoves for heating the house on those frosty coastal mornings. Fast internet for when I just had to check my work email and Slack, even though I was allegedly on vacation. Great DVD collection for those nights when Paso rolls up its sidewalks early. Lisa and Randy are great hosts. If you have any questions or issues, they step up and make it right. This visit, though, ends on an anthropomorphic note: All through the week, there was this giant hawk patrolling the property, rising and falling on the thermals, and coming to rest on the telephone/power pole on the property line outside the kitchen. Every morning I would step outside and wave to it, and the hawk would just look at me like, "You're scaring away my breakfast." Then, the day we were leaving, I gave it one last wave as we finished packing up. And the hawk stands up and spreads its giant wings and holds the pose. Now, I know this is all coincidental, the hawk was just warming itself in the morning sun at precisely the same time we are driving away. But then, as our car descended the gravel road down the vineyard hillside, the hawk kinked his right wing into what could only be seen as a salute. What the...? I guess we have to come back soon to see if Mr. Hawk remembers us. Comfortable cottage with excellent view and attentive owner. The wifi wasn't working during our stay, so the owner very kindly gave us a substantial rebate in compensation. Had a lovely time and will return, hopefully soon. My friend and I do a yearly girls' getaway here, and it is perfect for that. My husband and I were in need of green scenery. We fell in love with this cottage at first sight. It is tastefully appointed, from linen, to furniture to dishware and silverware. Beds are very comfortable. And, there is a professional massage table in the master bedroom. What a nice surprise! There is no dishwasher, but i did not miss it much. Outside, there is this gorgeous view on the vineyards and two adirondacks to enjoy the morning coffee. There are various seating areas to enjoy the outdoors, including a double chaise for sunbathing, a corner sofa for the evening drink AND and an outdoor fire pit ! You can hear the cars a bit from the nearby CA-46, but it is not bad at all. Traffic is light even on week ends. Lisa called in the morning to check on us and share insider info about wine sales and events in the area. Nice attention. My only regret is that our stay was too short to enjoy this place. It is a little gem. I can’t wait to go back for a longer stay. Perched atop the Stromsoe Vineyard, a producing 5 acre vineyard of Pinot Noir and Pinot Grigio, you'll enjoy a country retreat setting. It's only 2 minutes to the first wine tasting opportunity on the 'west side' in the York Mountain AVA. Our location is generally 15 degrees cooler than downtown Paso in the summer. You can visit dozens and dozens of fine wineries within a 10 mile radius. Be sure to take a sunset stroll on one of our uncrowded, pristine beaches less than 15 minutes from your door! Close proximity to downtown Paso, its wonderful restaurants and wine events - this location has it all!